Sign Up for "Blue Sky Bulletin"
Welcome to the Blue Sky Bulletin! Periodically, I will be writing a newsletter about what’s going on in the world of Maine Wild Blueberries, fiddleheads and the fresh herb business. It won’t be very long but will contain interesting tidbits and pictures. Right now, we are covered in snow and waiting for some warm weather! Here is a picture of wild blueberry plants in the winter. Notice the small buds-they will produce blossoms in May and, hopefully, blueberries in August. It’s good to have the plants completely buried in snow because it protects the plants from the cold weather. If the plants are exposed to frigid temperatures for too long, it results in “winter kill”. The cold kills part of the plant and they will not bear fruit that year. Because wild blueberries are in a 2 year rotation, we have to wait another 2 years for a chance to harvest berries off these plants. Some years, this is a big problem and farmers lose part of their crop before they even get started! So let’s hope the snow stays on until the warm weather is here. These plants are in this field, which is owned by Sanford Kelley. It has a beautiful view of Mason Bay in Jonesport. Some of his land came from a grant his ancestors received for fighting in the Revolutionary War! You can learn more about Sanford by viewing his profile (and other growers) in this website. By buying his blueberries, you are helping keep this land open and saving it from being developed. Have you ever noticed how much little kids love wild blueberries? They are really good and remind me of little frozen popsicles. Here’s a little girl enjoying some at a friend’s house in Cherryfield. 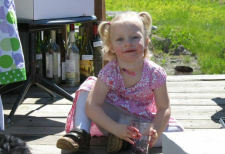 You will notice a few wine bottles in the background, which reminds me of another way wild blueberries can be enjoyed! If you have any pictures of kids enjoying wild blueberries, please send them in and I will share them in the next newsletter. We will have a contest and the cutest one will win A BIG PRIZE!! Please sign up if you would like to receive more of these newsletters. Until then—enjoy the snow while it’s here and remember—Eat your wild blueberries!